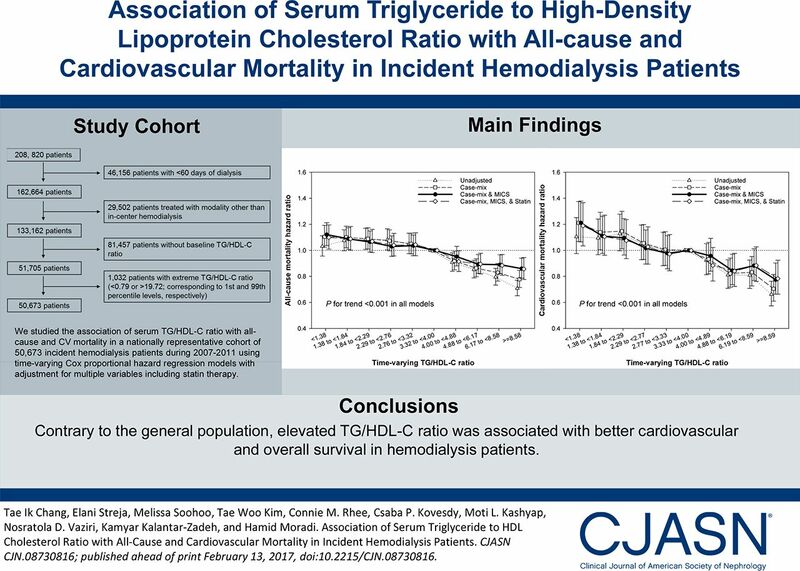 Background and objectives Elevated serum triglyceride/HDL cholesterol (TG/HDL-C) ratio has been identified as a risk factor for cardiovascular (CV) disease and mortality in the general population. However, the association of this important clinical index with mortality has not been fully evaluated in patients with ESRD on maintenance hemodialysis (MHD). We hypothesized that the association of serum TG/HDL-C ratio with all-cause and CV mortality in patients with ESRD on MHD is different from the general population. Design, setting, participants, & measurements We studied the association of serum TG/HDL-C ratio with all-cause and CV mortality in a nationally representative cohort of 50,673 patients on incident hemodialysis between January 1, 2007 and December 31, 2011. Association of baseline and time-varying TG/HDL-C ratios with mortality was assessed using Cox proportional hazard regression models, with adjustment for multiple variables, including statin therapy. Results During the median follow-up of 19 months (interquartile range, 11–32 months), 12,778 all-cause deaths and 4541 CV deaths occurred, respectively. We found that the 10th decile group (reference: sixth deciles of TG/HDL-C ratios) had significantly lower risk of all-cause mortality (hazard ratio, 0.91 [95% confidence interval, 0.83 to 0.99] in baseline and 0.86 [95% confidence interval, 0.79 to 0.94] in time-varying models) and CV mortality (hazard ratio, 0.83 [95% confidence interval, 0.72 to 0.96] in baseline and 0.77 [95% confidence interval, 0.66 to 0.90] in time-varying models). These associations remained consistent and significant across various subgroups. Conclusions Contrary to the general population, elevated TG/HDL-C ratio was associated with better CV and overall survival in patients on hemodialysis. Our findings provide further support that the nature of CV disease and mortality in patients with ESRD is unique and distinct from other patient populations. Hence, it is vital that future studies focus on identifying risk factors unique to patients on MHD and decipher the underlying mechanisms responsible for poor outcomes in patients with ESRD.